Justin Scott was born on 26th August 1986, in Meridian, Mississippi USA. 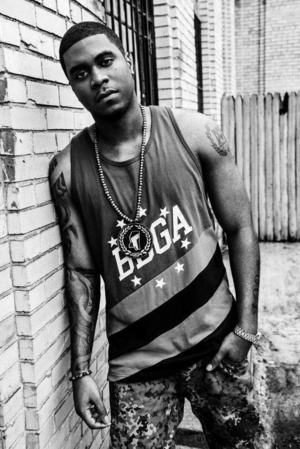 He is best known to the world as a rapper and record producer under the name Big K.R.I.T, where the initials stand for “King Remembered in Time”. His glory days started with the release in 2010 of “K.R.I.T Wuz Here”. He has collaborated with various artists of the rap scene, including Wiz Khalifa and Curren$y. He has been active as a rapper since 2005. Have you ever wondered how rich Big K.R.I.T is? According to sources it is estimated that Big K.R.I.T`s net worth is $400,000, an amount gained through his career as a rapper, as well as producer, collaborating with already mentioned rappers. He has released six albums until now, with the most recent one being “Cadilactica” in 2014. K.R.I.T.’s birth-place influenced a lot of his music and lyrical style. From the early age of twelve he started rapping, and his producing skills started to develop since he was 14 years old. He would sit for hours, learning about different programs which can be used for mixing, focusing mostly on Mtv Music Generator. Before he became critically accepted, he released several mixtapes; one of them being “Hood Fame” with a DJ called Wally Sparks. He as well appeared on the third album of the rapper Curren$y, “Pilot Talk”. In addition he also appeared on Wiz Khalifa`s “Kush and Orange Juice”. His name then was Kritikal, but with his commercial success he changed it to Big K.R.I.T. He broke into the rap scene with his mixtape “K.R.I.T Wuz Here” in 2010, which was made digitally available, and in short time acquired critical success. This allowed Big K.R.I.T to sign with Def Jam Records. Since then his career has only risen higher and higher, as he was on a tour with Wiz Khalifa and Curren$y on their shows in Baltimore, New Jersey Winston-Salem and North Carolina. Big K.R.I.T. has produced records of other successful rappers and continued mixing his own albums. In 2011 he released his next record, called “Return of 4Eva”, which featured other critically accepted rappers; one worth mentioning is Ludacris. This album propelled Big K.R.I.T even higher, and was named as “the best of the month” by “Slant Magazine”. His first studio album was released in 2012 and was named “Live from the Underground”; it debuted at number one on the Hip and R&B and Rap Charts, and earned him even better critical reviews, and added more fans which of course affected his net worth. Before the album was released he toured with rappers Method Man and Curren$y on the “Smoker`s Club Tour 2011”. Following the release of “Live from the Underground” he toured with the rapper Slim Thug, which also influenced on his net worth. In 2013 Big K.R.I.T. released the album entitled “King Remembered in Time”, which wasn`t as successful as the previous release, but it received positive reviews. It featured rappers such as Smoke DZA, Wiz Khalifa and Trinidad James. In 2014 he released his sixth album entitled “Cadilactica”, before the album released in the whole; it featured two singles, “Mr. Olympus” and “Pay Attention”. Overall, his career is quite successful, and it features a number of successful rappers as collaborators, and is only starting to develop. It is sure that Big K.R.I.T is a name to be heard more about. Regarding his personal life little is known, however, his first love is the music he produces. 1 Everybody's been booed at least once in their life. You talk about legends - I found out that Outkast got booed before. Lauryn Hill had been booed at the Apollo. It's all about what you do with that experience and how you react onstage. All of that plays Into what kind of performer you'll be in the long run. The Bling Ring 2013 performer: "Live From The Underground"
Sama'an Ashrawi's All-Star Tribute to U.G.K. 2013 Documentary Big K.R.I.T.